Update: Calendars are now back in stock at Walldaddy! See link below. When I posted the Holiday Gift Guide, some of you recommended checking out The Office DVD Wall Calendar by Trends International. And you guys are right, it’s a great calendar! Each month is chock full of photos, episode quotes, MySpace-like bio trivia, and funny props. Very cleverly put together, with Office fanatics in mind. The calendar also includes a DVD of twelve .JPG files (one of each month, 1280×1023), which you can use as your computer’s wallpaper. 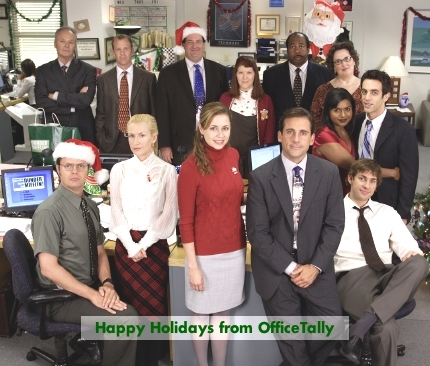 Walldaddy sells the DVD wall calendar (sorry, looks like it sold out again), as well as posters of Michael, Dwight, and the five leads. Use the coupon WDGNRL10 for another 10% off. 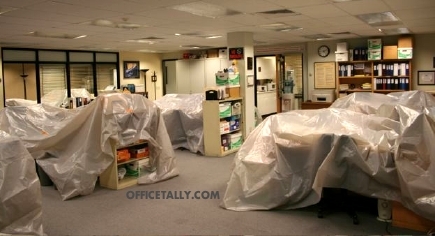 Photo taken by Tallyhead Brad after The Office set shut down in November. TIME names ‘The Office’ #6 in its Top 10 Returning TV Series list. MSN names ‘The Office’ the Best TV Show of 2007. ‘The Office’ is the third most popular search at Entertainment Weekly. The Office is the 7th most DVRed TV show of the season. ‘The Office’ places high on Watch With Kristin’s Top 10 Shows of 2007. Jenna Fischer’s MySpace blog is one of Entertainment Weekly’s 20 Best Celebrity Blogs. How ‘The Office’ ranks in Season-to-Date 18-49 Performance. 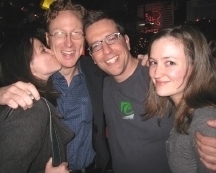 2007 Webby Awards: one nomination in one category; one win. Also received two People’s Choice awards. The Office Convention and the WGA Strike were the events of the year. Indubitably. If you are in Atlanta, Craig Robinson performs at The Punchline tonight. Today is the LAST DAY to get OfficeTally’s 10% discount at the NBC Store! Just click the graphic in the sidebar and enter the coupon code OFFICETALLY. Tallyhead Ivy files this report from The Lonesome Trio’s performance in New York City last night. My friend, Katherine, and I wandered into Manhattan to see The Lonesome Trio play at the Parkside Lounge. Since we both really love Ed Helms, we decided to drink some wine at a local Italian wine bar before heading over, to calm our nerves and embolden us to actually talk to Ed Helms (is bold the right word?). Back by popular demand, vote one Season 1 episode off the island every few days, until we’re left with the most popular episode as the ULTIMATE SURVIVOR! Status: Season 1 now complete. Thanks for voting! Are you trapped in a house where people are watching the Patriots/Giants game, and there’s nothing for you to do? Create a sign with any of these nifty sign generators. Your message has gotta be Office-related. Upload your sign somewhere (DO NOT link directly to atom smasher), then post a link to it in a comment below. Contest ends when the Patriots/Giants game ends. I am telling you upfront that I will be totally arbitrary in how I pick prize winners. There might not be any, there might be a few. I might award Target goodies, or maybe even one of those highly-sought-but-impossible-to-find Office DVD wall calendars. Dunno. THE CONTEST IS NOW CLOSED (8:22pm PT). See prizewinners after the jump. Thanks, everybody, for playing! Post now reopened for comments. No new entries, please. Thanks! Here is Steve Carell’s tribute to Steve Martin at the 2007 Kennedy Center Honors, which aired last night.